The action in this racing game is viewed from above and features rotational controls. Every once in awhile you come across a game that just makes you scratch your head and wonder what someone was thinking when they let a game like this actually get released. 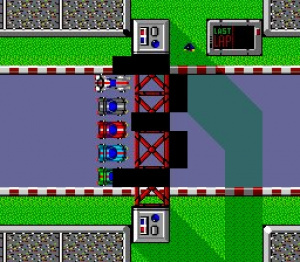 After the success of RC Pro-Am and Micro Machines on the NES, overhead racers began to gain popularity. 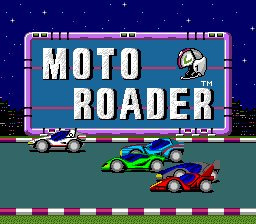 It would seem that NEC was looking to capitalize on that sudden popularity with the release of Moto Roader. The only problem with that idea was that RC Pro-Am and Micro Machines were actually good games and Moto Roader wasn't even close. 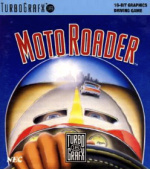 There are several glaring flaws in Moto Roader but it's the play control that ultimately ruins the experience. If a car begins to fall behind the pack, the game will automatically grab the car and move it back up into the pack, taking away a little extra fuel for the trouble. You might think that this would help you out, but once you begin to fall behind it seems like this constantly being moved back up to where the other cars are begins to become more of a problem than an aid and it also tends to disorient you and your car making it difficult to correct your car's heading and get back on track. As if this wasn't bad enough, it also works the other way. If you begin to pull ahead of the other cars, the game will once again automatically pull the lagging cars back up to where you are thus defeating any great driving you had just performed. Couple this with the fact that you basically end up racing the same style track over and over again with only a few different turns and obstacles, and what you get is a confusing, sluggish, and completely uninspired racing game. As you can surely see from the screenshots, there's not much too look at in Moto Roader's visuals. The high point would have to be the cute girl in the bikini, but it's pretty much all down hill from there. 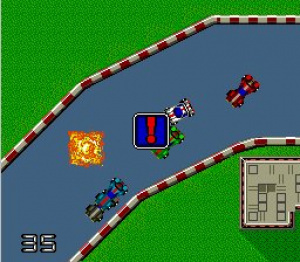 You get basically the one racetrack, and although the game does feature several different layouts of the track along with a variety of hazards and obstacles, the basic look and colors don't really change. It's pretty much the same bland racetrack over and over again. Even the shop screen is nothing more than a dull gray-tinted screen with text on it. Even some minimal color variations on the tracks would have helped out a little bit. It's quite clear that the same amount of attention was given to the visuals as was given to the play control. After seeing the rest of the game you wouldn't expect much from the sound and music in the game but the music in the game is actually the high point. While it's not much more than two songs, at least they managed to get these two songs right. They've both got a very up-tempo and peppy feel to them that at least adds a little spice to an otherwise tedious racing experience. It would have been nice to have heard a few more tracks, especially given that these two that are here are both pretty good. As for the sound effects, they're pretty much nonexistent. Even the car sounds are more of an afterthought than anything that comes remotely close to standing out. I hate to keep bringing up the bad news but for those of you out there who are looking for a good overheard-style racer, you might want to hold out for Nintendo to release the NES versions of RC Pro-Am or Micro Machines for the Virtual Console. Other than the one musical track, I can't think of one single other good point to talk about other than the moment when I turned the game off after two and a half hours of playing it. I always wondered why this game was released in the first place, but it's even more puzzling to wonder why it was re-released for the Virtual Console with so many other great games waiting to be released. Unless you're someone who owned this game originally and for some unexplainable reason liked it, don't bother with this one.